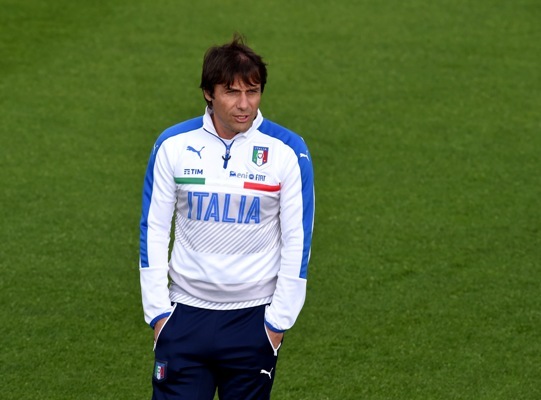 IMAGE: Italian national team head coach Antonio Conte looks on during a training session. Photograph: Claudio Villa/Getty Images. Italy manager Antonio Conte named his provisional squad for the European Championship on Monday, and his selection was notable as much for the player he left off as for those he chose. Milan's Mario Balotelli will not be part of the team for the championship matches, which start on June 10. That is not a huge surprise; Conte has named the mercurial striker only once since taking over in 2014. "It's up to him to show he can be included, just as it is with the others," Conte told Italian reporters in December. "But he has got so, so much to prove." Veteran midfielder Andrea Pirlo and winger Sebastian Giovinco were also omitted. Italy is in Group E of the 24-team tournament, along with Belgium, Sweden, and the Republic of Ireland. They face Marc Wilmots' Belgian side as their first opponent on June 13. AC Milan captain Riccardo Montolivo and Paris St Germain midfielder Thiago Motta have been called up, but their physical condition still needs to be verified. Juventus midfielder Claudio Marchisio and Genoa goalkeeper Mattia Perin will miss the championship because of injuries. The 23-man Euro 2016 squad will be announced on May 31.